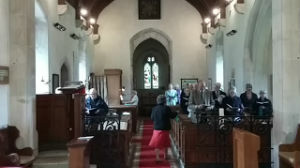 Most congregations are of retirement age, with a few younger families and single people; it is hoped that the Youth Group will encourage younger people into church services. Attendance at services varies, with festivals and especially Christmas being much higher. Other very popular services are the annual Animal Service and the service on Mothering Sunday. The church dates back to the 14th Century and major restoration work took place in the 19th Century. The church is well cared for open daily and is always decorated with flowers. it is set in pleasant grounds in the middle of the village, maintained with wildlife in mind. Visit us at TripAdvisor. On street parking is available and access to the church is level. Local home owners do make their toilets available on request for special occasions.